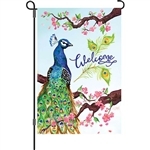 A huge selection of flags featuring birds and birdhouses. 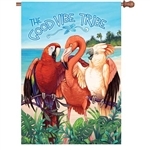 Many designs featuring, cardinals, hummingbirds, wrens, orioles, chickadees, and other songbirds to add a bit of serenity to your yard or garden. 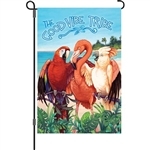 Loon Family Decorative Flag - Standard - 28" x 40" - $2 OFF!! 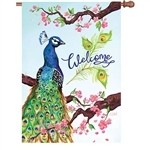 BLUEBIRD HOUSE Decorative Standard Size Flag - 28" x 40"
BLUEBIRD HOUSE Decorative Garden Flag - 12" x 18"
HOVERING HUMMER Decorative Standard Size Flag - 28" x 40"
HOVERING HUMMER Decorative Garden Flag - 12" x 18"
LOON Decorative Standard Flag - 28" x 40"
LOON Decorative Garden Flag - 12" x 18"
WELCOME HUMMINGBIRD Decorative Standard Size Flag - 28" x 40"
Bird Feeder Truck Decorative Flag - Garden 12" x 18"
Bird Feeder Truck Decorative Flag - Standard 28" x 40"
Christmas Birdhouse Decorative Flag - Standard 28" x 40"